UNITED NATIONS, January 13 -- The UN cannot get cash into Gaza, despite protests from its Secretary General Ban Ki-moon, and therefore cannot pay its staff members. Meanwhile, the UN's John Ging told the Press from Gaza on Tuesday, Hamas is meeting its payroll in the Gaza Strip. Ging called this embarrassing, but has declined to answer Inner City Press' question about any steps being taken by the UN to get cash into the Strip. Inner City Press asked the General Commissioner to whom Ging reports, Karen AbuZayd, about the entry of cash into Gaza before the current offensive by Israel began. 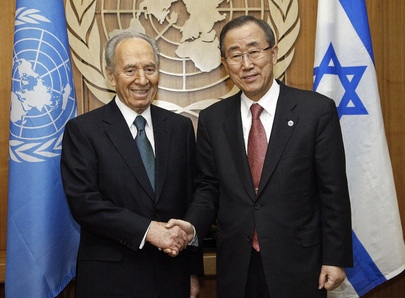 On October 31, 2008, AbuZayd told Inner City Press that Ban Ki-moon himself had to call Israel's president to push to allow currency in, to pay the 11,000 staff members of the UN Relief and Works Agency. Inner City Press asked about reports that UNRWA is paying taxes to Israel, despite what are called its privileges and immunities. Yes, Ms. AbuZayd said, we pay, to use the port and taxes, to make claims, hoping to be paid back. Video here, from Minute 49:31. Afterwards, Inner City Press asked Ms. AbuZayd if she or Ban have pushed this tax issue. No, she said. For the past days, Ging has provided video-link briefings and responded to questions. Inner City Press asked him to respond to claims by Israeli diplomats and newspapers, that his agency UNRWA has been "taken over by Hamas," and that Hamas has looted aid trucks at the Karem Shalom crossing. Ging has denounced these as distractions, emphasizing that he has been provided with no proof. Why is only one trucking company being used? How does UNRWA decide from whom, and at what prices, to buy non-emergency goods in Gaza? These questions have not been answered. Ging has been steadfast in his call for international investigations and for accountability, including for the UN if it is found to be in the wrong. He has not, however, fully answered how UNRWA decides who to allow into its shelters. Is a militant who puts down his -- or her -- gun still a militant? Israel targeting a building full of people because one or two might be Hamas leaders is, beyond the laws of war, eminently predictable. So if the UN allows in an unarmed Hamas-affiliated person, does it tell the people already in the shelter? Should it? The briefings have been by Ging, accompanied until Tuesday by UN humanitarian coordinator John Holmes. Inner City Press asked Holmes a question about the killing of hundreds in the Congo. While Holmes to his credit answered, the UN Deputy Spokesperson then limited further questions to Gaza. On Tuesday, when Ging had not been told in advance that Holmes would not be there, the Spokesperson pointedly followed a questions about more killings in the Congo by saying, most of you are here for Gaza. The audience had dwindled for less than a dozen reporters. Karen AbuZayd herself was not even in the region, but rather in Norway. When Inner City Press asked why, Ging said it was a trip scheduled before this round of conflict, to raise funds. The Spokesperson quickly introjected that AbuZayd will accompany Ban on his tour through the region, which will not include the Gaza Strip. We'll have more on this.